A few months ago when The Rainyard had to cancel an appearance at In The Pines, The Jangle Band (or at that time The Jangle Brothers) were hastily put together – sans rehearsal – to play the classic Perth pop songs of Jeff Baker, Ian Freeman and Joe Algeri. An outfit that wasn’t supposed to last the duration of the weekend, found the time to pen a couple of tunes and spawn a single. 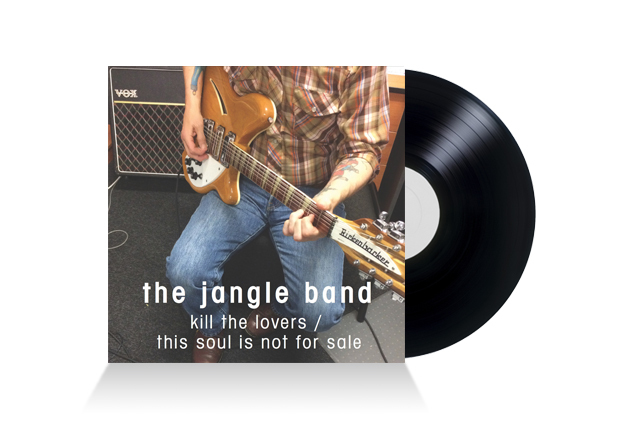 Recorded in bedrooms across Perth and Melbourne for each members convenience, The Jangle Band franchise was solidified. When Baker and Freeman last put out music together, cassette was the medium of choice but Kill The Lovers/This Soul Is Not For Sale finds them dragging their spotted and paisley attire into the digital age. Jangle is indeed at the forefront during Kill The Lovers which has a Byrds, Younger Than Yesterday vibe. Five vocalists in the band make for some lush harmonies, but it is Freeman who steals the show with a tone that hasn’t been hindered in the slightest by father time. The flip side, This Soul Is Not For Sale, draws from the same well, with guitars that chime and a sleek melody that would be the envy of Paul Chastain. With no set plan or agenda, not even the members of The Jangle Band know where, when or if they will turn up again. In any case, they have given us pop perfection via the two songs on Debut Single.